Since yoga was invented in India thousands of years ago, it's become a common activity for many people. The word "yoga" means "union," and I definitely see how it brings our bodies, feelings, and minds together as we practice it. I've been enjoying adult yoga classes for a few months, since it helps me relax, unwind, and exercise. It's also an activity my girls and I can enjoy together because it's fun and healthy. Do you need playful peace? Practice yoga as a family and gain these nine benefits. How many hours a day do your kids play with electronics? Yoga classes get your kids offline and moving, and yoga helps them tune in to their bodies and emotions. They learn to be present in the moment and find entertainment outside of their electronic devices. Some of those yoga poses are not easy to find and hold! They require concentration, focus, breathing, and patience. Those skills transition to everyday life, too, as our kids study in school, play an instrument, or hold conversations at the dinner table. I know body awareness and body acceptance can be challenging for kids and adults. During yoga, we move, bend, and contort as we learn to appreciate our body's capabilities, shape, size, and appearance. Confidence grows, too, as we master new poses and skills. I love how my girls and I feel better about ourselves and our bodies thanks to our yoga class. The way you breathe can affect your heart rate, digestion, ability to fight illness, hormones, cell oxygenation, nervous system, and fat-burning capabilities. Breathe better and enjoy better health with yoga, since it expands lung capacity and gives you an improved sense of well-being. Before my yoga class the other day, I was stressed, anxious, and worried. As soon as I unrolled my mat, I felt my mind and emotions begin to clear. I ended the class feeling relaxed and calm. My girls tell me that they enjoy the same mental and emotional clarity. After yoga, they feel less anxious and more confident about facing school exams, relationship bumps, or other childhood challenges. Exercise is essential for growing bodies. Kids need it to build muscle strength, work out their heart, and maintain a healthy weight. Even though yoga doesn't appear to be strenuous, the variety of poses works out almost every muscle group, gives kids a solid workout, and encourages them to stay active, since it's an activity they can enjoy for life. It takes time to master new yoga poses. I'm so proud of my girls when I watch them persevere even after they fall. That perseverance can help them succeed in all areas of life. When my girls started yoga, they could barely balance on one foot. They've gotten much better now, and it's exciting to watch them become more stable and strong. Balance and flexibility are essential for the development of fine and gross motor skills, and these traits give kids greater confidence as they play outside, participate in sports, and maintain proper posture in school. Every time my girls and I take a yoga class together, we leave feeling rejuvenated and agree that we need to keep doing this activity as a family. It's a fun way to get exercise and play together. Your family can enjoy the same benefits when you take a yoga class that welcomes kids and adults. 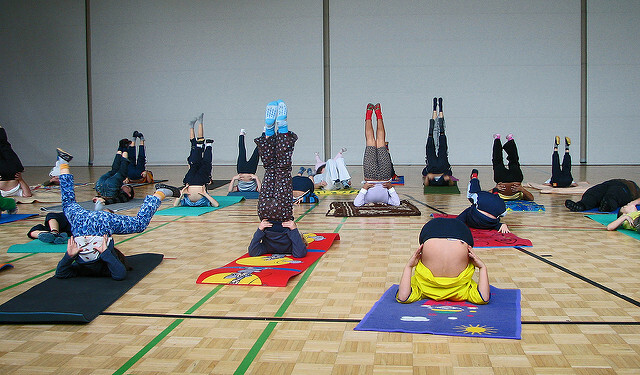 Yoga provides nine benefits for kids as it builds strong bodies, healthy emotions, and smart minds. Find a yoga class near you and exercise, unwind, and enjoy playful peace together as a family.